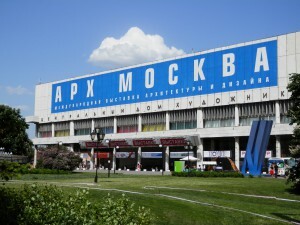 On Saturday the 23 of May the plane carrying my father and me landed at Domodedovo airport, which is Moscow’s, and Russia’s, largest airport. We had arrived for a thirteen day trip to Russia in which we would visit the cities of Moscow and Saint Petersburg. A stern woman stared at my passport and at my face, after which she stamped my visa and admitted me to the Russian Federation. 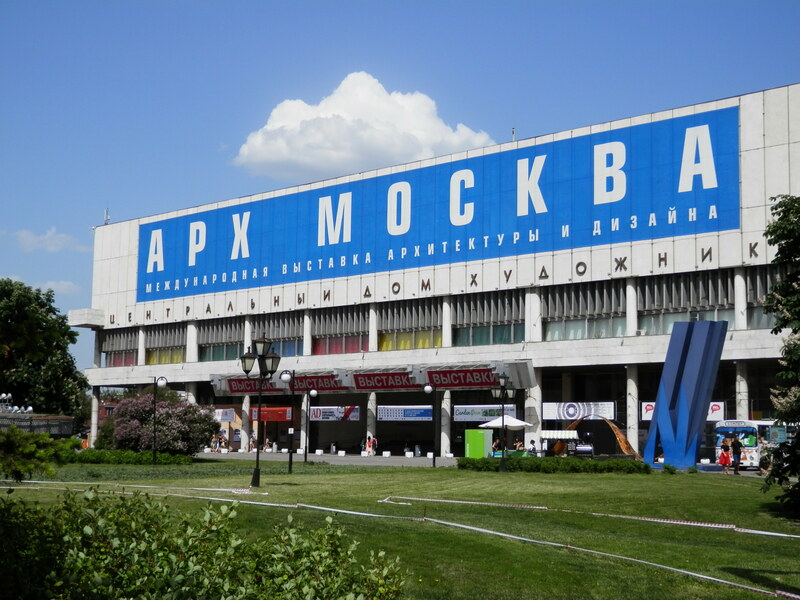 The airport is about 40 km to the southeast of Moscow center but there is a direct train, the Aeroexpress, from the airport to the Paveletsky Rail Terminal, from which there is access to the Moscow metro. The metro stations are very beautiful, some of them are real pieces of art. There is quite some security present, and this could explain why I did not notice any vandalism or graffiti. We took the metro to Kuznetskiy Most and then walked ten minutes to our hotel: the Budapest Hotel, not the Grand Budapest, but close enough. The hotel is incredibly long: our room was on the fifth floor and after exiting the elevator we had to walk around 200m in the corridor before reaching our room. The room was spacious with two beds and a sofa, it had air-co and a TV of the old days, a pre-flat screen model, but I was not planning on spending much time in the hotel room, except for sleeping. 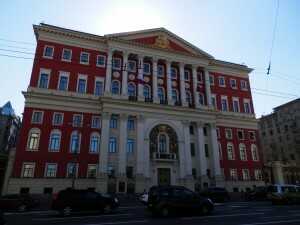 The hotel has an excellent location: it’s only a short walk to the heart of Moscow: the Red Square. 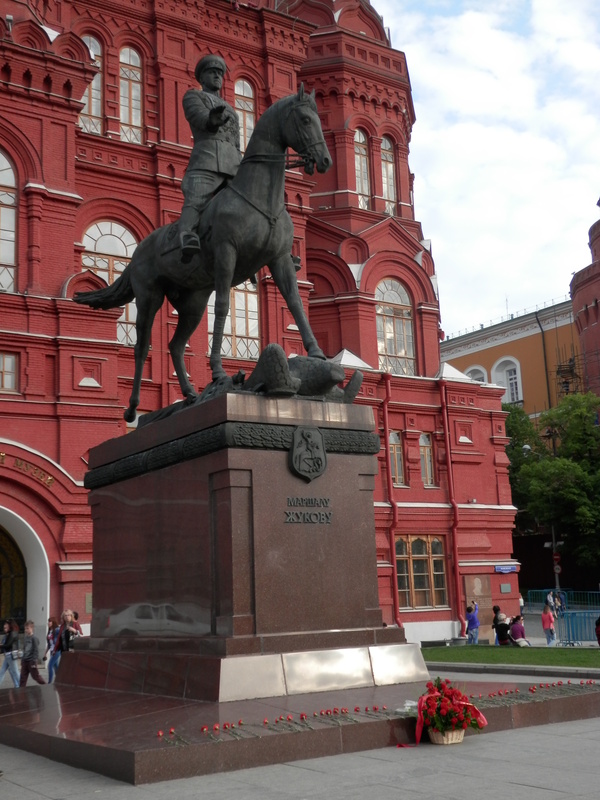 We passed the Bolshoi Theater, the big statue of Karl Marx on the Revolution square and reached the statue of Marshal Zhukov, the commander of the Red Army during the Second World War, who stands before the State Historical Museum, which is on the western side of the Red Square. We entered the square and I found it smaller than I had imagined. 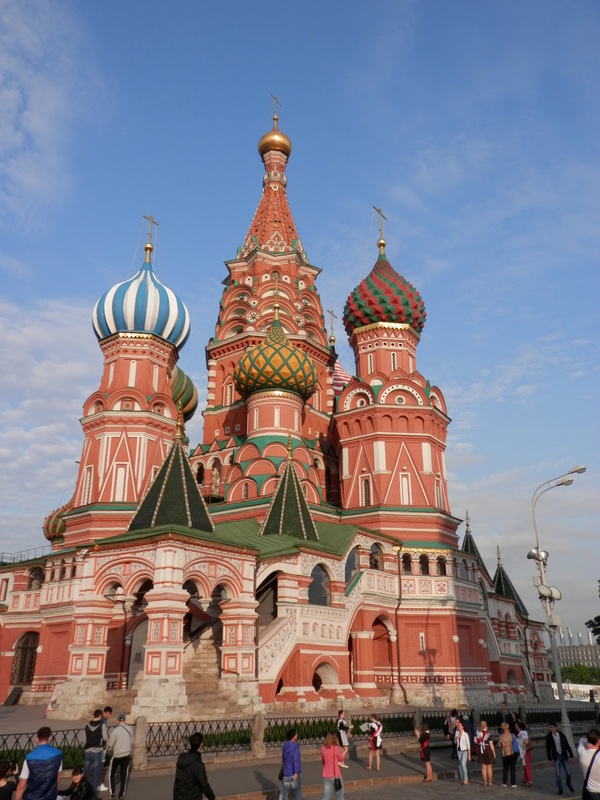 It’s still impressive though, with the Kremlin wall and the Spasskaya Tower with its clocks on the southern side of the square, the GUM shopping center on the northern side, and finally with the awe inspiring St Basil’s Cathedral on the east side. There was a big podium on the square, which diminished slightly the appeal of it. We later learned the podium was intended for the festivities of the Day of Cyrillic Alphabet, which takes place each year on the 24th of May, and would remain on the square for the remainder of our visit. 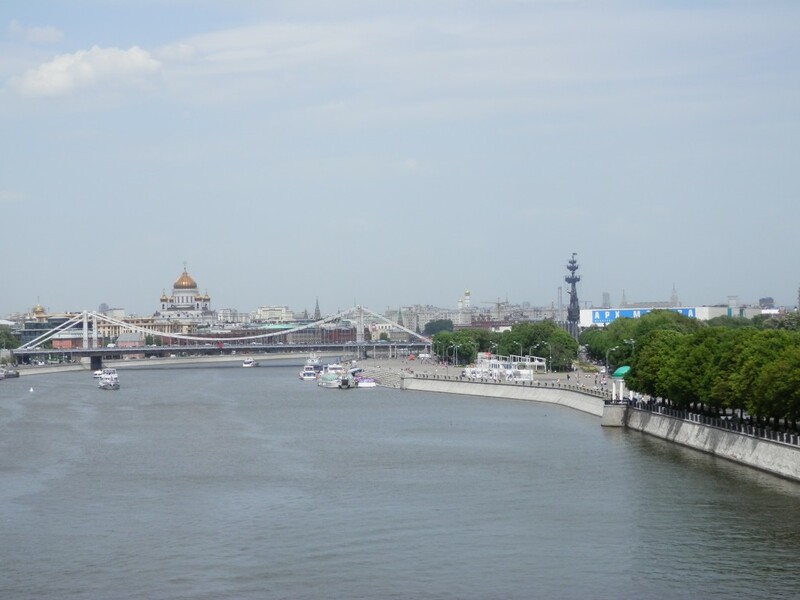 We crossed the square, passed the cathedral and walked halfway over the bridge across the Moskva river, which gave us a nice view over Moscow. The Kremlin is fortified complex with several churches, museums, and government buildings such as the official residence of Russia’s president and the senate. The Kremlin has an enclosing wall with towers, and we walked along this wall from the river edge all the way back to Zhukov. 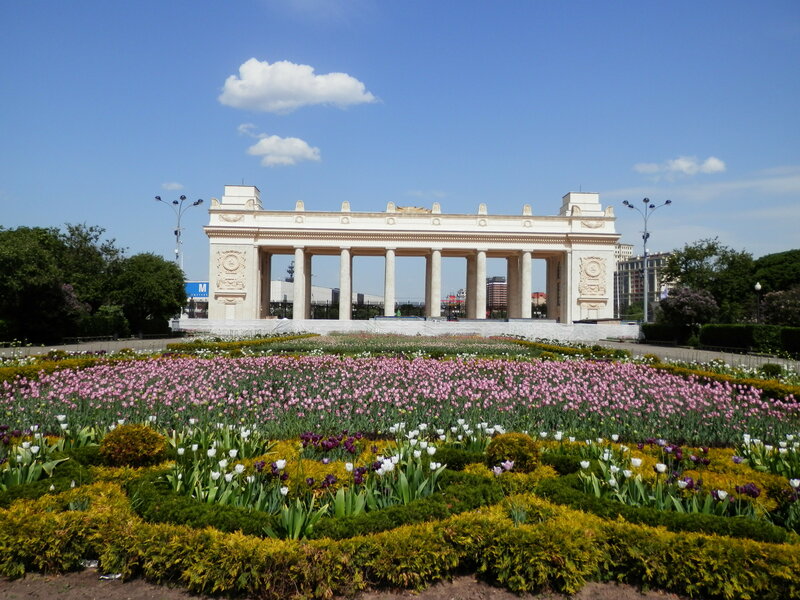 The final part lead us through the Alexander gardens, with flower gardens, fountains and the Tomb of the Unknown Soldier, before reaching Zhukov. Getting thirsty, we walked back to the hotel and midway found a place with beer and food. Back in the hotel we had a vodka in the bar and ended the evening with watching the Eurovision song contest on Russian TV. 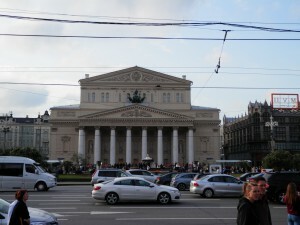 The first evening gave us a favorable first impression of Moscow. 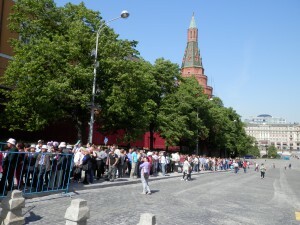 On Sunday we noticed that the Red Square was blocked by police: the festival for Cyrillic language was being held on the square and entry was with tickets only, we saw a very long queue the day before. We walked along the GUM, which was also closed, but this because it wasn’t 10 o’clock yet, to a street lined with a series of churches, but they were all in scaffolding, hiding their domes from view. 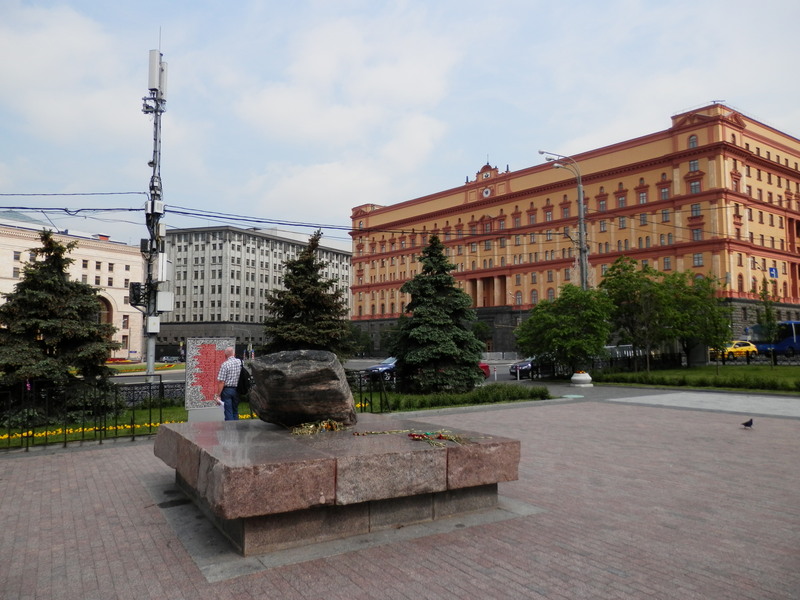 We continued to the Kitai-gorod neighborhood and the Lubyanka Square, where the monument in remembrance for political prisoners is, looking on the yellow building of the old KGB and the gray building of its successor FSB. 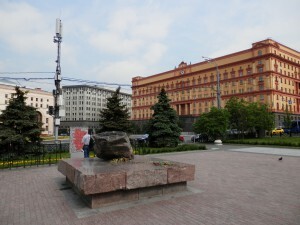 The monument consists of a stone from the Solovetsky islands, where prison camps of the Soviet Gulag system were located. We got an energy boost from a strong cup of coffee and walked north east towards the Clean Ponds. Until the beginning of the 18th century these ponds were called Dirty Ponds because local butchers polluted the ponds with waste until a prince acquired them in 1703, cleaned them out and renamed them to their current name. 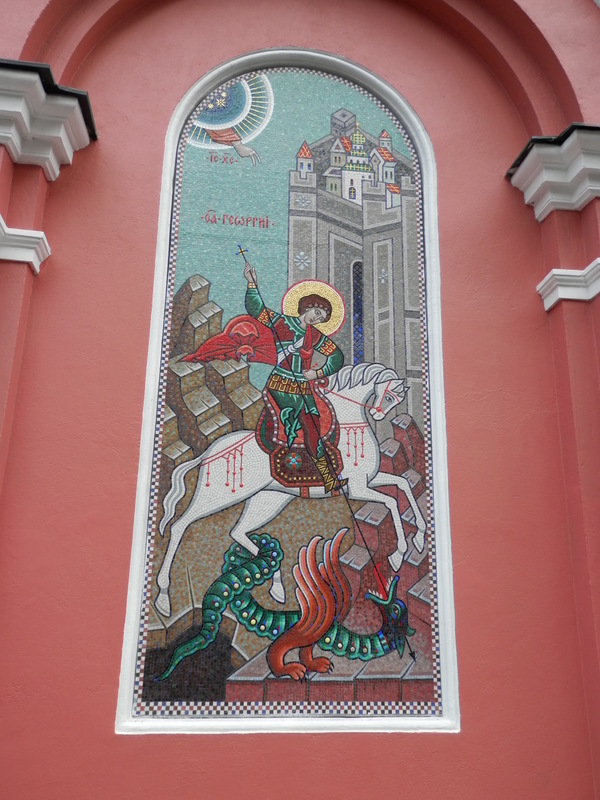 There are a great many small churches in Moscow, almost in every street there is one, and many of them have references to Moscow’s patron saint Saint George, the dragon slayer. 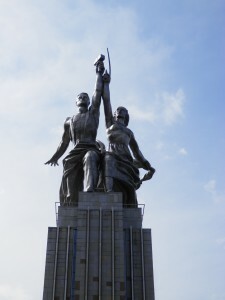 This image is also the coat of arms and is on the flag of Moscow. From the ponds we followed the green boulevard westward in the direction of the Tverskoy neighborhood. 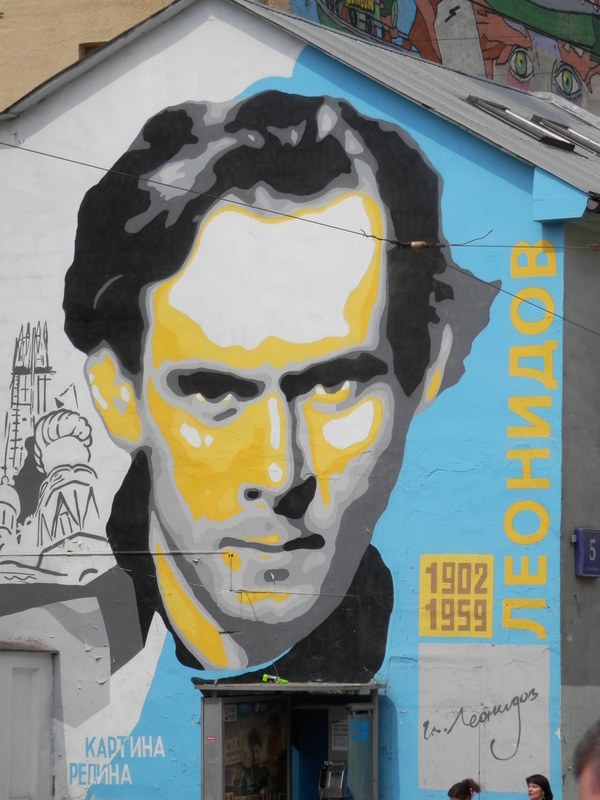 We passed the statue in honor of Lenin’s wife Nadezhda Krupskaya and when crossing the street we saw on a building in the intersecting street a large mural dedicated to Ivan Leonidov, a Russian architect and artist. We visited along the way the High Monastery of St Peter, which was a bit run down and in need of renovation. But on a happy side note, there were several cats sleeping in its garden. Across the street from the monastery is the Moscow Museum of Modern Art, with its freely accessible courtyard with statues. Where the street of the monastery and museum crosses the boulevard, we found a restaurant and had a beef Stroganoff. First on the terrace outside, later fleeing from the rain inside. Once the rain had diminished, we headed a bit north to the Hermitage gardens where a small rock concert was being held. Rain started pouring down again and we took shelter under a doorway. Once the worst had passed, I bought from a stand, and from the looks of it run by some young people to raise some money for an event, a freshly baked waffle on a stick and had it dipped in hot chocolate and sprinkled with grounded coconut. Yummy. We walked back to the boulevard and continued along it until we reached the statue for the poet Alexander Pushkin. 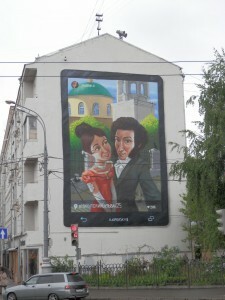 Pushkin and his lover Natalia are still very popular in Russia and there are a great many statues dedicated to them. Around Pushkin’s statue people were dancing in couples some classical dance. From Pushkin we broke from the ring way and headed east to the Patriarch’s Ponds. At the entrance of the pond there is a bogus traffic sign, placed by an unknown person, dedicated to Mikhail Bulgakov’s masterpiece The Master and Margarita, a book considered one of the great novels of the 20th century and of which I purchased a copy in St Petersburg. 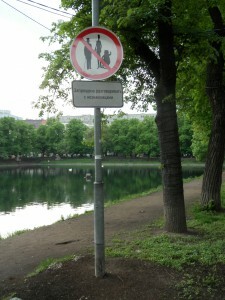 The sign has as accompanying text “Never talk to Strangers”, the title of the first part of the book. While my father and me were taking pictures of the traffic sign, we saw that other visitors started noticing this strange sign and also started taking pictures. It’s quite discretely placed and you don’t really notice that there’s an absurd sign, unless you know it’s there. 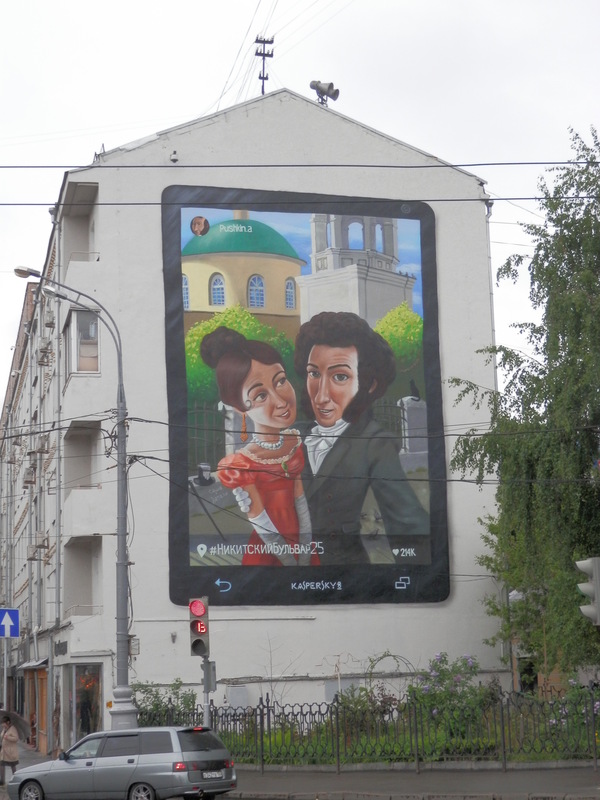 We continued south west, back to the ring way and to another square dedicated to Pushkin and Natalia, with a statue of the lovers and a large modern mural of Pushkin taking a selfie of him and his Natalia. A bit to the east of the square, you can find the Ryabushinsky Mansion, a house built by Russian architect Fyodor Schechtel, and the residence of writer Maxim Gorky after his return to the Soviet Union in 1932. The house houses a museum dedicated to the writer, but the architecture is much more interesting. The house was designed in it’s entirety, including the furniture. In order to avoid damaging the wooden floors, we had to were special slippers over our shoes. After leaving the house, we noticed the sky darkening and not much later heavy rains started coming down. With haste we passed the TASS building, the Russian news agency, and headed in the direction of the Kremlin to visit the GUM, crossing the Alexander Gardens once more. This three story high luxury shopping center, with its three parallel galleries is marvelous, but I’m not really into luxury shopping centers. After a vodka and a nap at the hotel, we returned to the Red Square around 11 o’clock in the evening, to see the red stars on the Kremlin towers lit up. 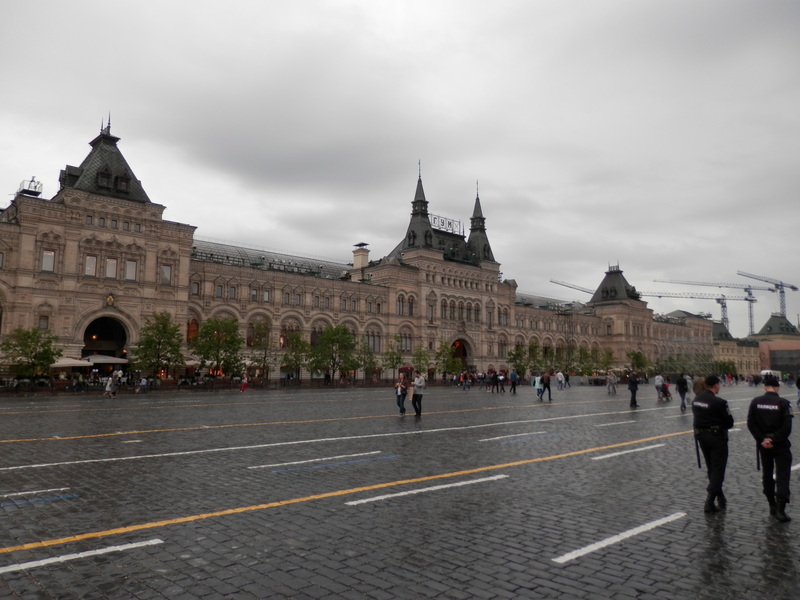 The atmosphere of Moscow center does not change at night: tourists are walking around, without any security concerns. 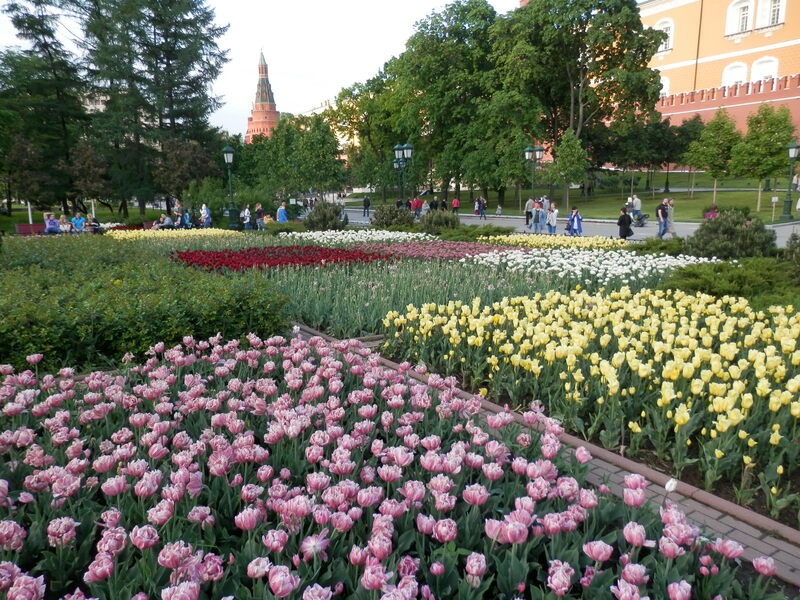 On Monday we visited the Kremlin itself, after purchasing tickets in the Alexander Gardens we entered through the south gate and walked along the Amoury, skipping the jewels and 10 Fabergé eggs inside, and passed the Grand Kremlin palace towards the Cathedral Square. 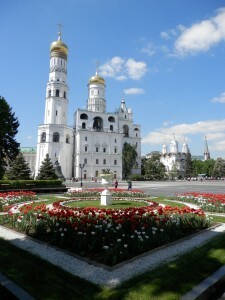 The square is surrounded by six buildings of which three are cathedrals. 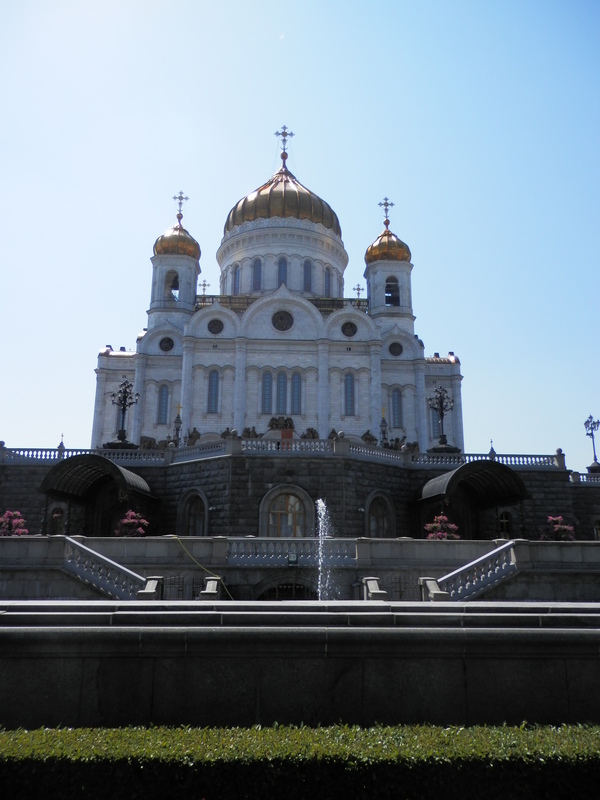 It was used for the coronation of the tsars and is still used for the inauguration of the Russian president. 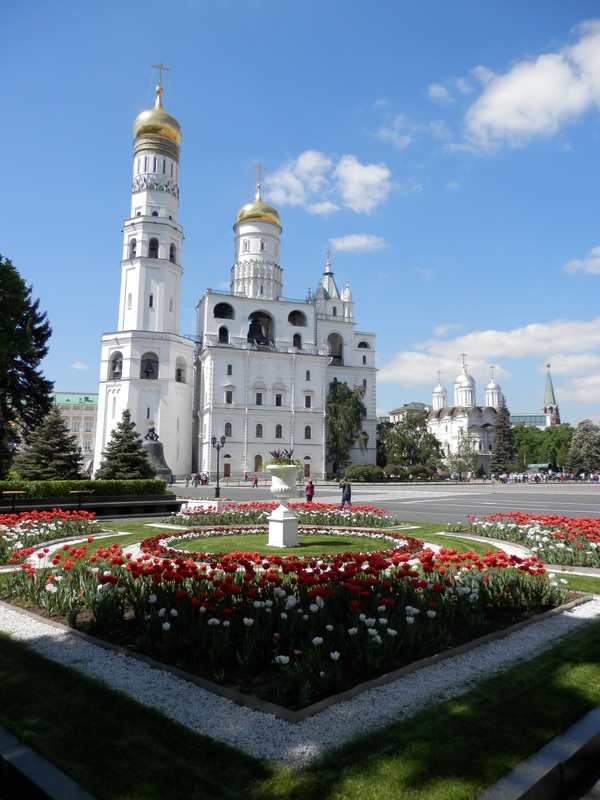 We visited the different cathedrals and churches and continued by strolling through the Kremlin gardens. When crossing the square separating the cathedrals and the garden, you have to follow an L shaped zebra crossing, if you cut corners or divert from the sidewalk at another location, one or several of the many traffic police agents start blowing their whistles, until the offender corrects his erroneous ways. We heard a lot of whistling, many of it directed at groups of senior Chinese tourists. We left the Kremlin through the Spasskaya Tower to the Red Square and visited St Basil’s Cathedral. Sadly the main church was being renovated, but the crypt and the side churches were visitable. I found it a claustrophobic experience wit a lot of small rooms connected to each other and low ceilings. In one of the rooms we found a 5 men choir singing Orthodox church music. Quite a special experience, my father bought a CD of them. As lunch we had some beer at our regular spot and afterwards walked the street towards Tverskaya street and headed north towards city hall. 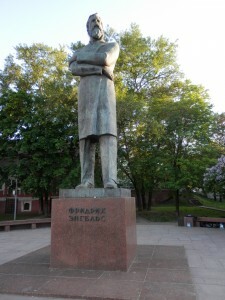 On the other side of the big street from city hall there is a small park tucked away with a statue of Lenin. 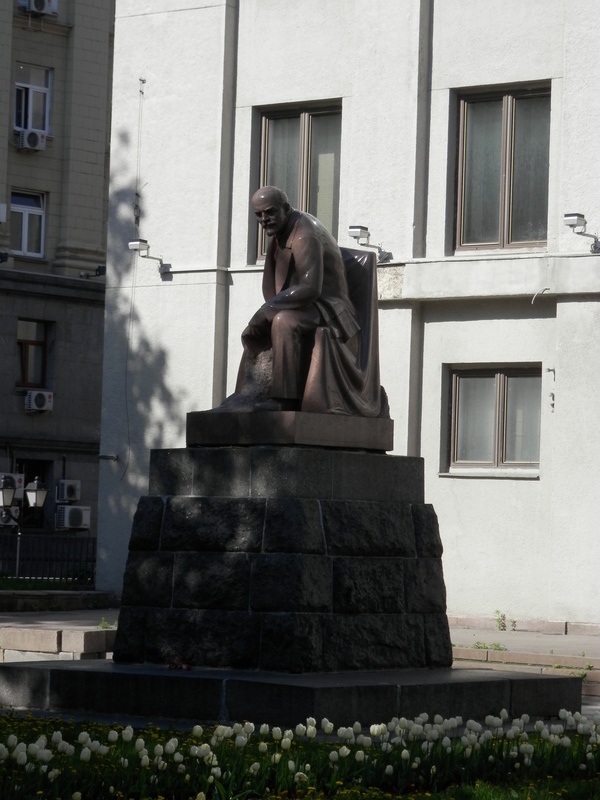 Ironically Lenin sits next to one of the most expensive shopping streets of Moscow. 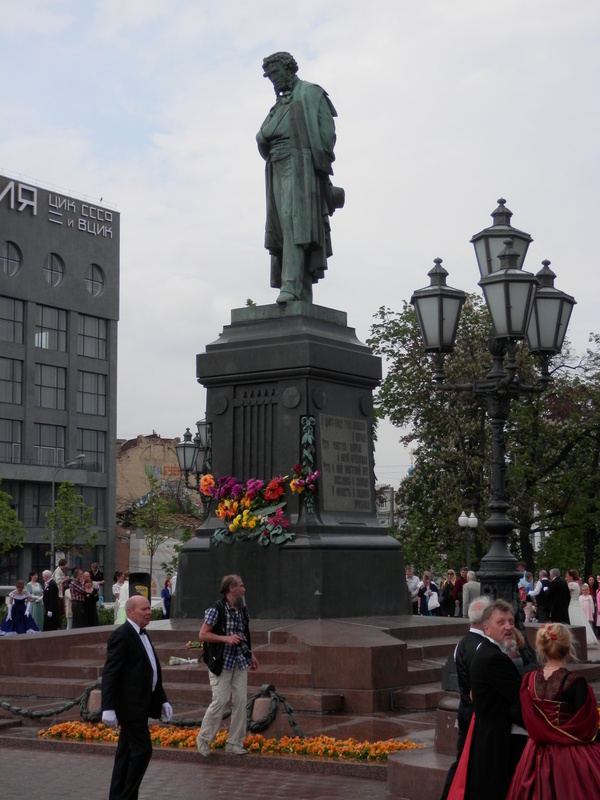 We headed to the statue of Pushkin that we saw the day before with the dancing and followed the ring way boulevard south to the Arbat neighborhood. 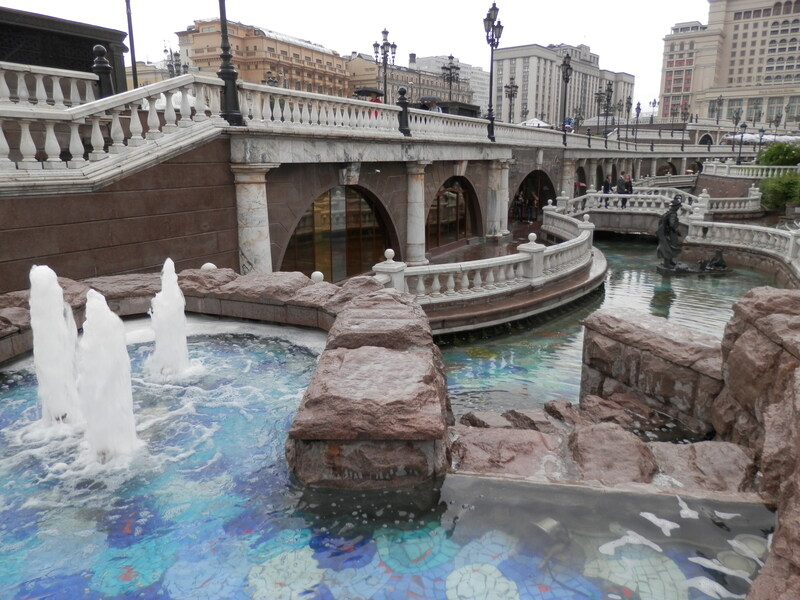 The car free New Arbat street is very touristic with a lot of shops and bars. My father bought a Russian flag hat in one of the shops. At the corner of New Arbat and Arbatskiy we found a good looking terrace with an even better looking red headed waitress. We had a bowl of borscht and a pint of beer on the terrace. 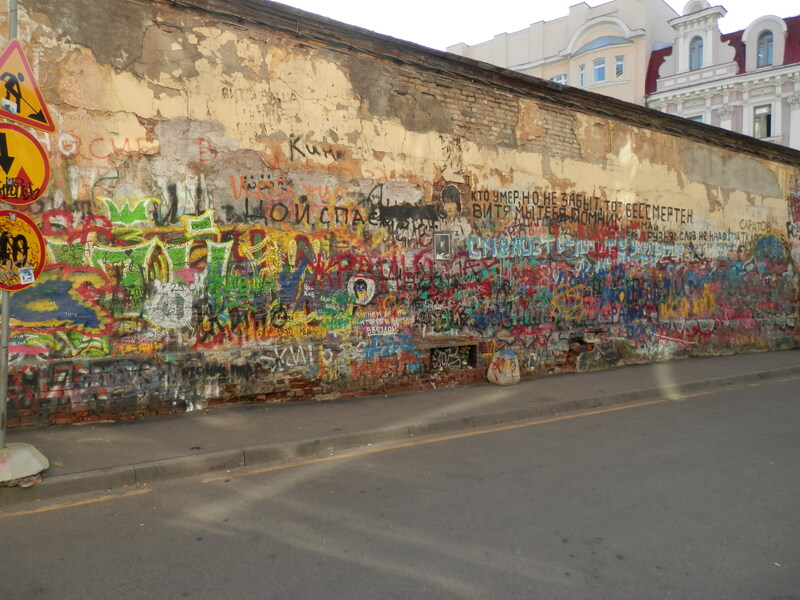 We continued westwards in New Arbat street and found the only graffiti in the city: the Tsoi wall at the intersection of New Arbat and Krivoarbatsky Lane, which is dedicated to Russian rock pioneer Viktor Tsoi who died in 1990. A bit further in Krivoarbatsky Lane there is a building in modern architecture style and further in New Arbat we found another statue of Pushkin and Natalia. 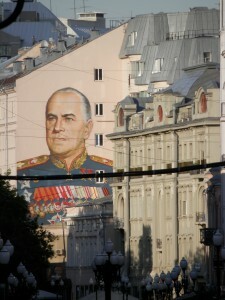 Looking back in the street we saw in the distance a large mural of Marshal Zhukov. At the end of the street there is one of the Seven Sisters, as the seven Soviet skyscrapers in Moscow are called: the main building of the ministry of Foreign Affairs. 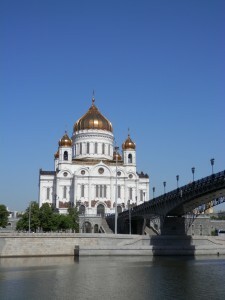 From here we walked towards the Cathedral of Christ the Saviour at the river side. Friedrich Engels is looking at the church from across the street. The church was already closed and we would visit it a later day. We circled the building and then crossed the pedestrian bridge halfway for a view over Moscow. 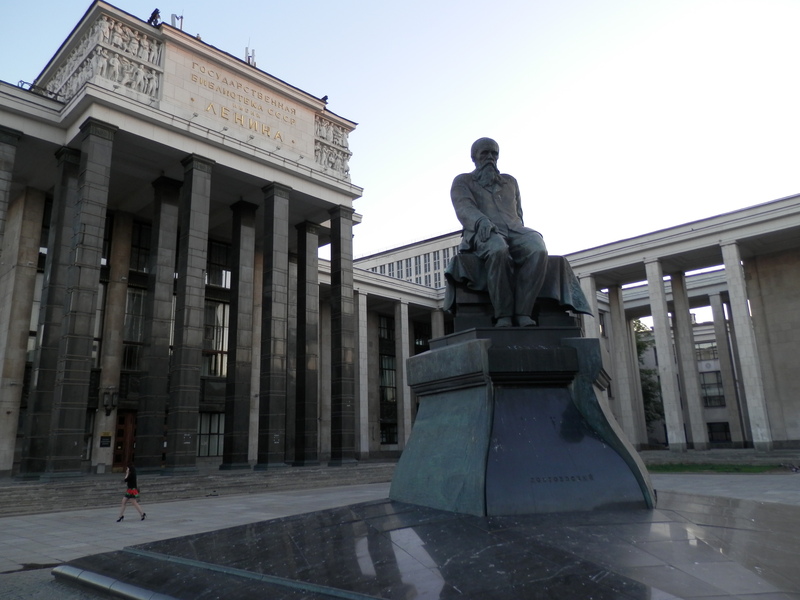 While walking back to the hotel we passed the National Library of Russia with a statue of Dostoyevsky in front of it. We ended the day with cookies and vodka at the hotel. On Tuesday we started our day with watching the changing of the guards at the Tomb of the Unknown Soldier in the Alexander Gardens. They do it every hour, and while waiting for the ceremony to commence, we both a pair of vodka glasses engraved with the Russian double-headed eagle that we saw the previous day in the Kremlin ticket office. Although it was before noon, the temperature was already quite high and would rise above 30 degrees Celsius. This probably explained why the next two guards were in white shirts,and not in their full garments as the previous two. 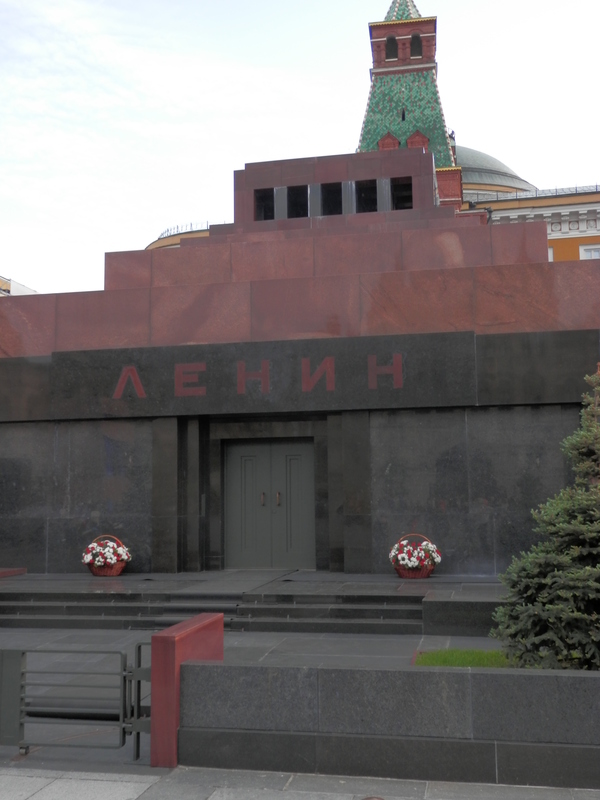 After the ceremony we went to visit the Lenin Mausoleum, which is at the middle of the southern edge of the Red Square, next to the Kremlin wall. There is always quite a queue because it’s only open three days a week between 10 and 1 o’clock, but it’s free and there is only a security check, so the queue passes quickly. 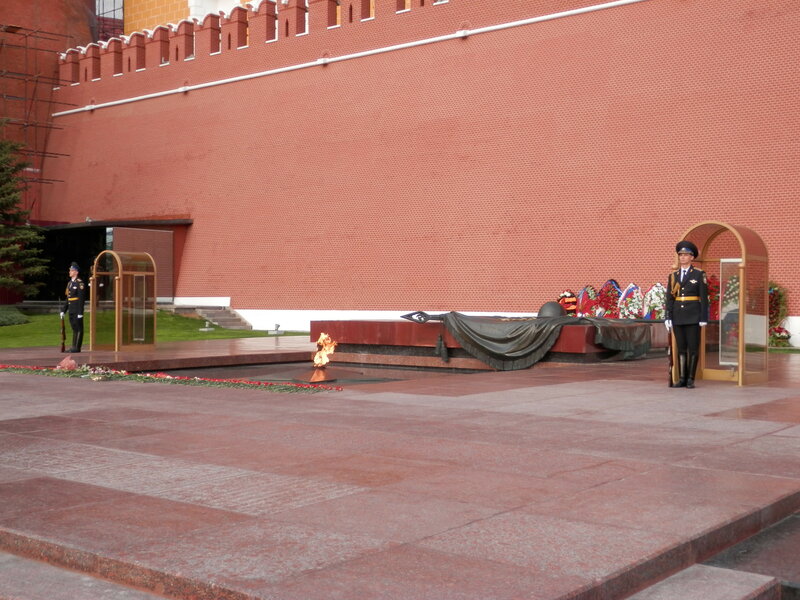 Seeing Lenin lying there, is quite impressive. You pass around him, at less than two meters distance. He is sealed in a glass coffin. It’s not allowed to take pictures and the room is quite dark with a reddish shine. 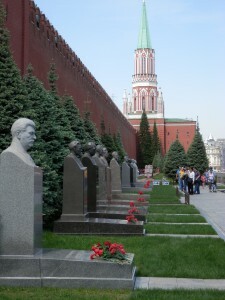 Before entering the mausoleum, you pass the tombs of other Soviet leaders, I noticed that Stalin has the most flowers. 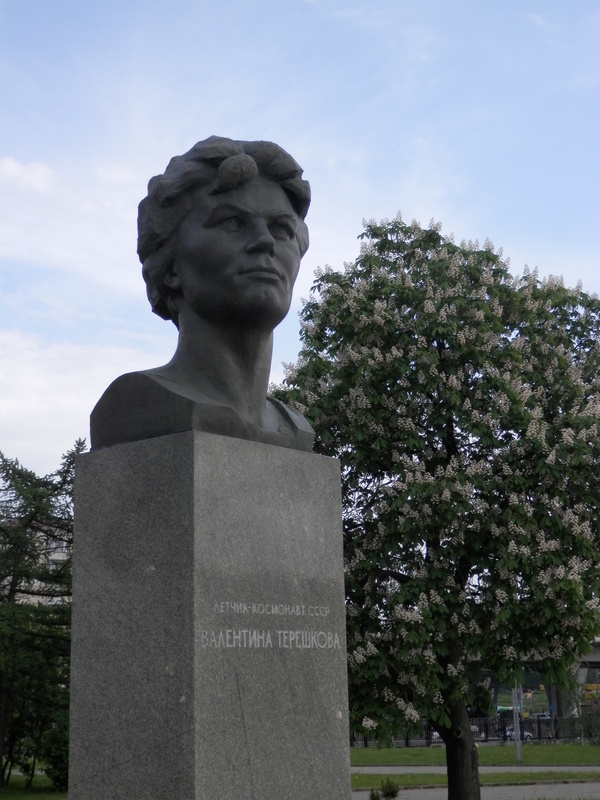 This is the only statue or public reference to Jozef Stalin I found in both Moscow and St Petersburg, except for the Fallen Monument Park. 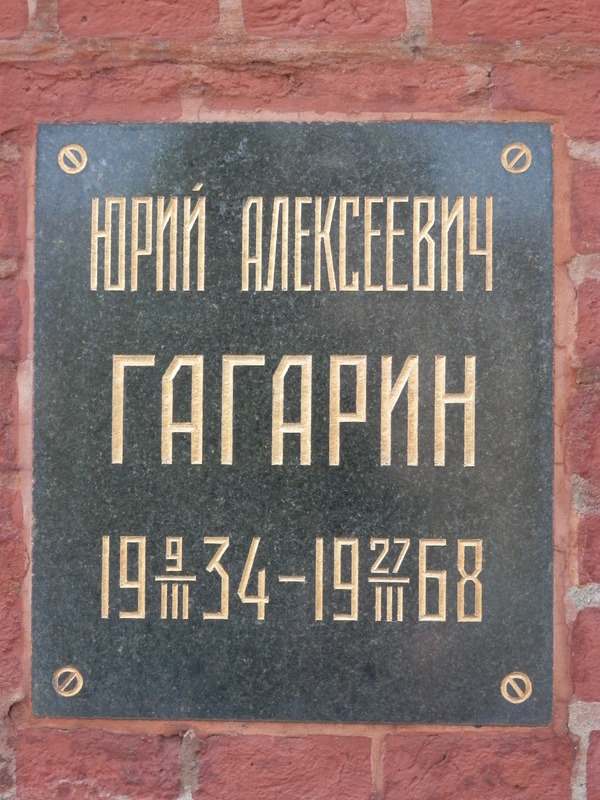 In the Kremlin wall there are other hero’s of the Soviet Union buried, such as Yuri Gagarin, the first human in outer space. 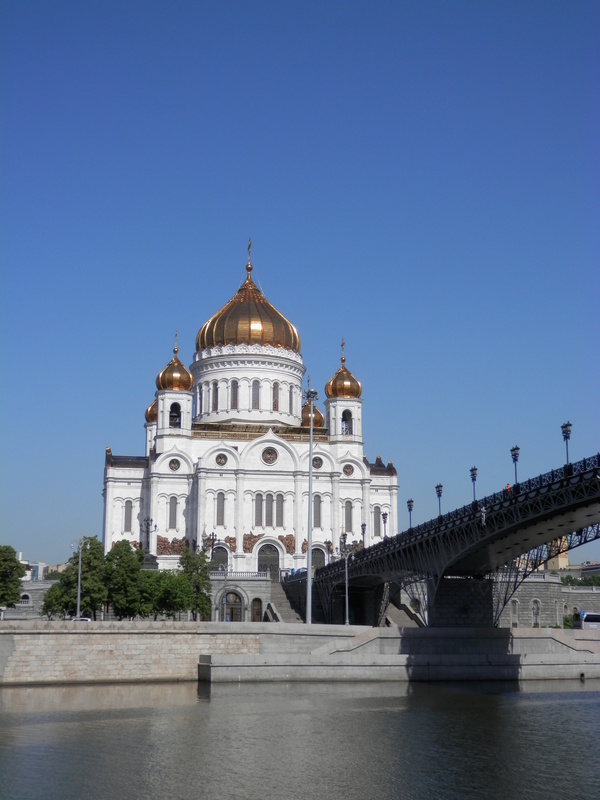 After exiting the memorial, we walked along the river and the Kremlin wall to the Cathedral of Christ the Saviour. 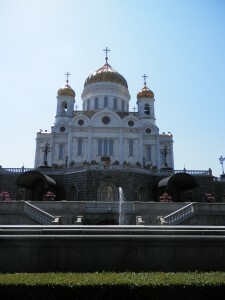 The cathedral is enormous and it is the tallest Orthodox church in the world. 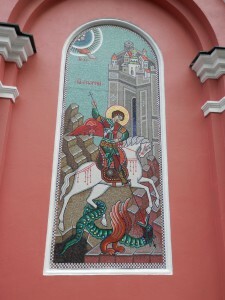 Stalin had the original church demolished in 1931, but between 1990 and 2000 the church was rebuild. 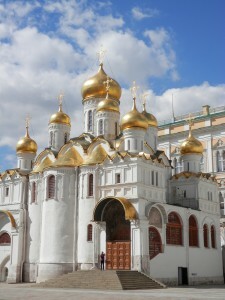 About 200kg of gold was used for the different domes, that shine magnificently in the sunlight. The church is also beautifully decorated on the inside. After visiting the church and refraining from buying an icon as souvenir, we returned to our normal café for a liter of beer. While sitting there my wallet dropped from my pocket but a woman sitting at a nearby table attended a waiter of this, and before I knew what happened I had my wallet back and before I could thanks someone they were back to their previous occupation. The Russians are not a talkative people, they just get things done. After lunch we visited some of the finer metro stations. The stations are highly decorated with murals, statues, chandeliers, and are incomparable to the cold and hard metro stations of the west. We concluded the evening at Pushkin Café, a restaurant which was highly recommended by TripAdvisor, and is situated not far from the Pushkin statue which we saw a few days before. The interior gives a feeling of a 19th century literary cafe with a lot of woodwork, it reminds me of Germany or Austria. It’s quite large, with multiple floors. We hadn’t reserved a table and were quite lucky to obtain one on the fly. The waiters were very helpful: giving explanations with the different dishes. We started with a, recommended by the waiter, Russian salad of garlic marinated red cabbage and pickles, followed by borscht and as main dish a sort of minced lamb covered with bread-crumbs accompanied with potatoes baked in their peel. All dishes were very good. We ended with, also recommended, a horse radish vodka, which has, of course, a very intense radish taste. A very good and recommendable experience, only down side was that a few hours later, in the middle of the night, I woke up with an unquenchable thirst: the food was probably quite salty. 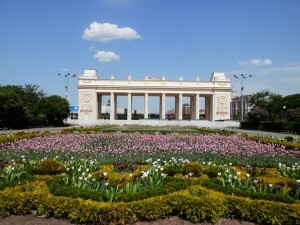 Gorky Park is a large park to the south of the city center along the bank of the Moskva river. To reach it we walked from our hotel to and through the Alexander Gardens towards the Cathedral of Christ the Saviour, crossing the pedestrian bridge behind the church to the Balchug island in the middle of the Moskva river. At the far end of the island there is the old Soviet chocolate factory which in old times made the entire neighborhood smell of chocolate, but which now is closed. 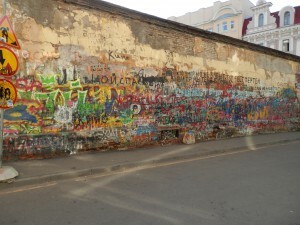 Currently it houses artists, bars, restaurants and clubs. 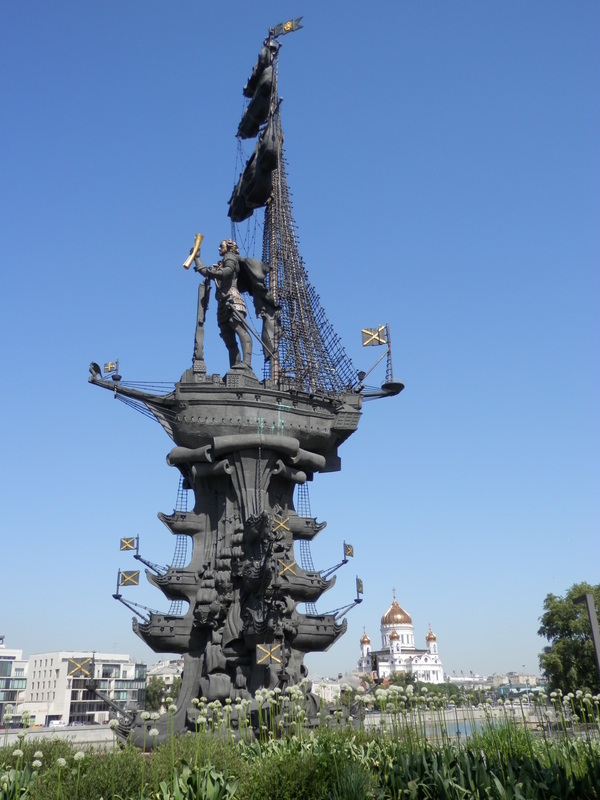 Next to the factory an enormous bronze monument in honor of Peter the Great has been erected. It’s quite controversial and I agree with the critics: it’s a extravagant display of kitsch. 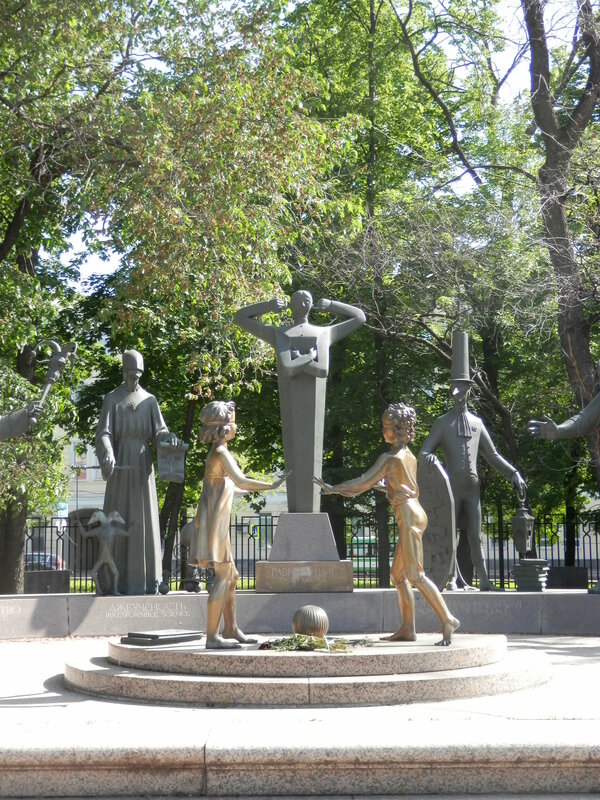 To the north of the factory on the Bolotnaya square you can find the bronze statue group Children are the Victims of Adult Vices, which was unveiled in 2001, displaying adult vices closing in on a playing boy and girl with a large middle figure being indifferent. On the east side of the island there is a line of love trees, similar to the Paris bridge filled with locks, and you can lock you lock on an iron tree. As such, they don’t have to worry as in Paris that the bridges will collapse. We crossed the river to the south bank of the Moskva river and headed in the direction of the Peter the Great statue. We entered the Fallen Monument Park, a sculpture park full of old statues of the Soviet time, at first they were gathered here and piled up, but now they have been formed in a statue park. 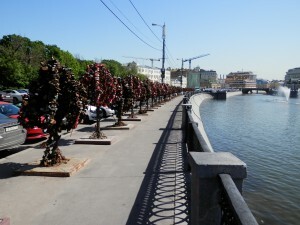 Further south along the river is the New Tretyakov Gallery, a large museum displaying Russian modern art. 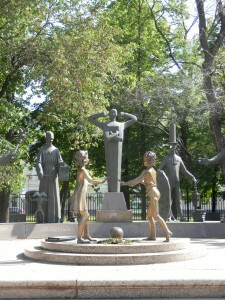 We had lunch in the small cafeteria of the museum and afterwards crossed the street to the entrance of Gorky park. The park is very large and filled with lots of people cycling, skating, relaxing… It has a several bars, ponds and even a beach where people sunbathe. 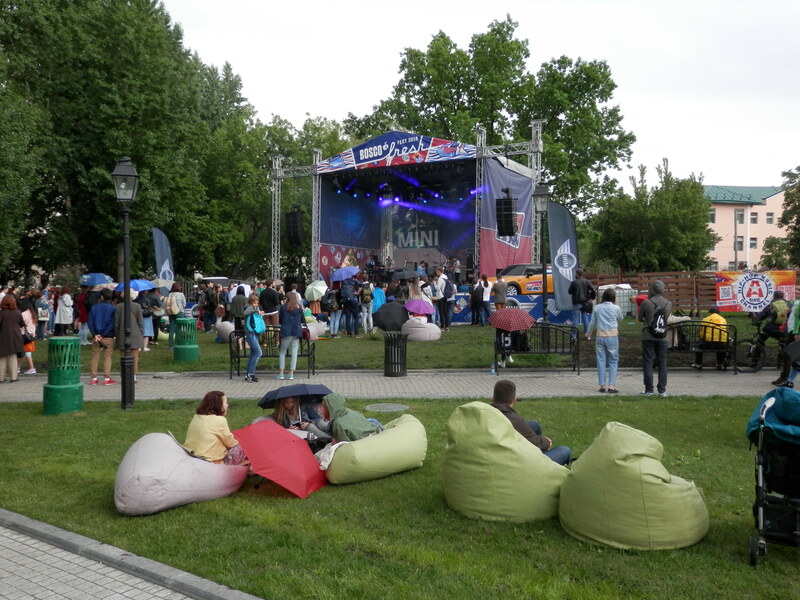 Midway the park we crossed the river and headed to the Novodevichy Convent. This cloister has remained virtually intact since the 17th century and has become a world heritage site in 2004. 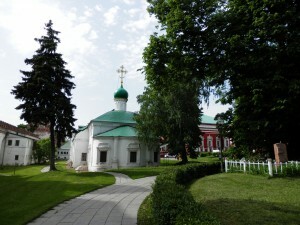 We strolled through its gardens and visited several of its buildings and churches. Next to the southern wall of the convent is the Novodevichy cemetery where we saw the graves of Boris Yeltsin, Nikita Khrushchev, Sergei Eisenstein and Nikolai Gogol. The info stand was unmanned, so we couldn’t buy a map of the cemetery . On the big info board at the entrance we first had to search/translate the names of the famous people whose graves we wanted to see, and then note down their coordinates, the sector and the row their grave was to be found. 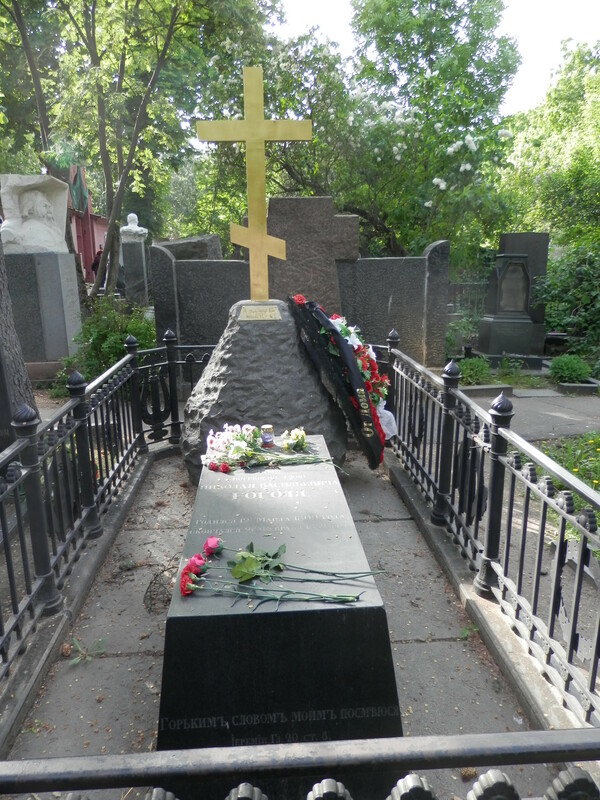 While searching for Anton Chekhov, we ran out of time, for it was 5 o’clock and the cemetery was closing. 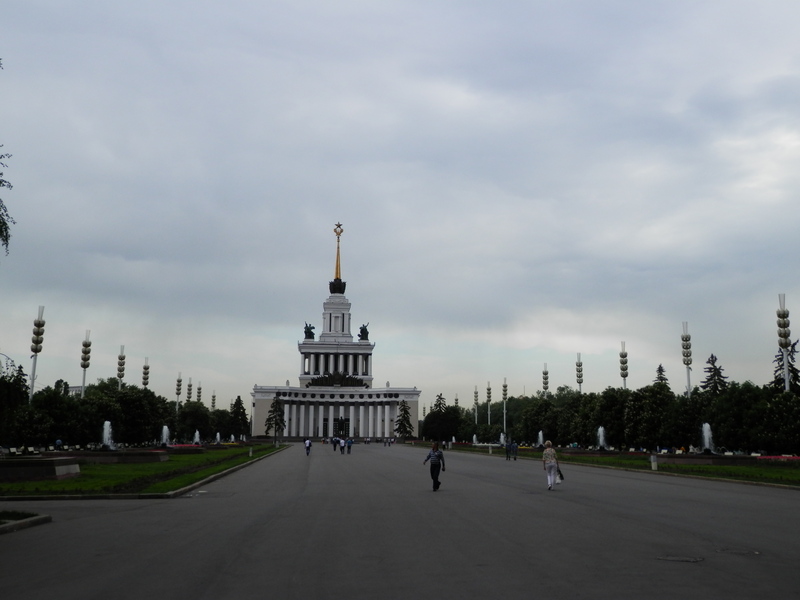 We pushed on south to the Moskva river, accross the sporting facilities around the Luzhniki Stadium. 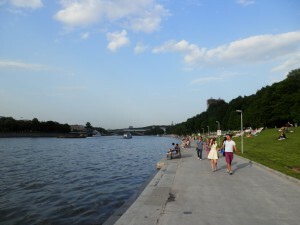 When we reached the river, we walked along it to Vorobyevy Gory metro station which is on a bridge across the river. We used the bridge to cross the river to Vorobyevy Gory park or Sparrow Hills in English. 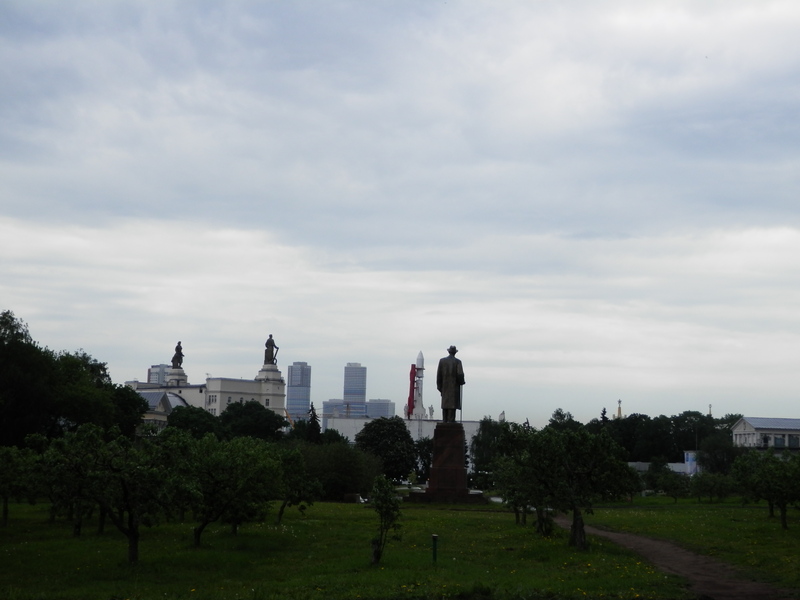 We sat a little on the grass to rest and then walked up the Sparrow Hills to the observation point, near the Moscow State University. From some points the view was spectacular, but trees were blocking a complete view over Moscow. 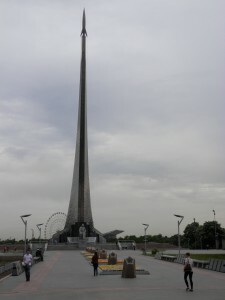 It started to rain a little so we called it a day and took the metro at Vorobyevy Gory station back to the center, where we concluded the evening with pizza and beer on a terrace with a view on the Alexander Gardens and the Tomb of the Unknown Soldier. 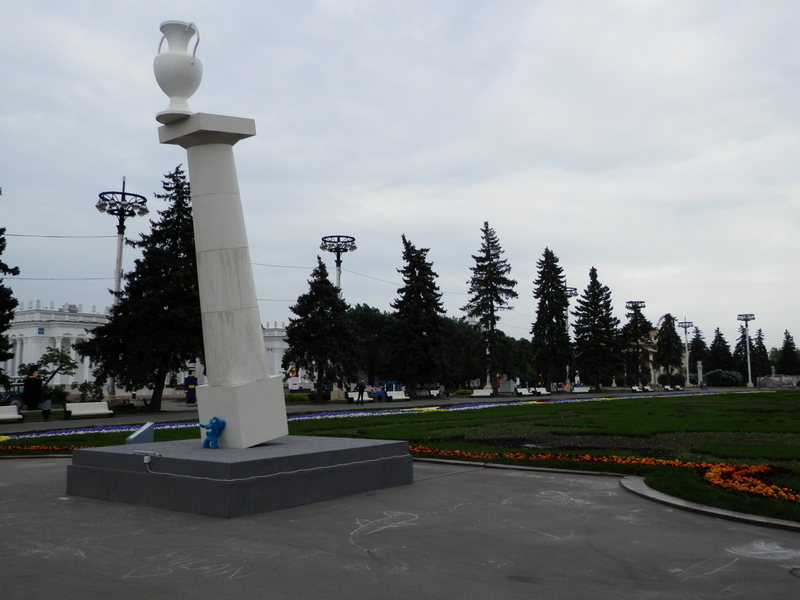 It has the strangest statue dedicated to a former president, Boris Yeltsin, I’ve ever seen: A small blue dog holding a large column with a vase that’s threatening to fall. 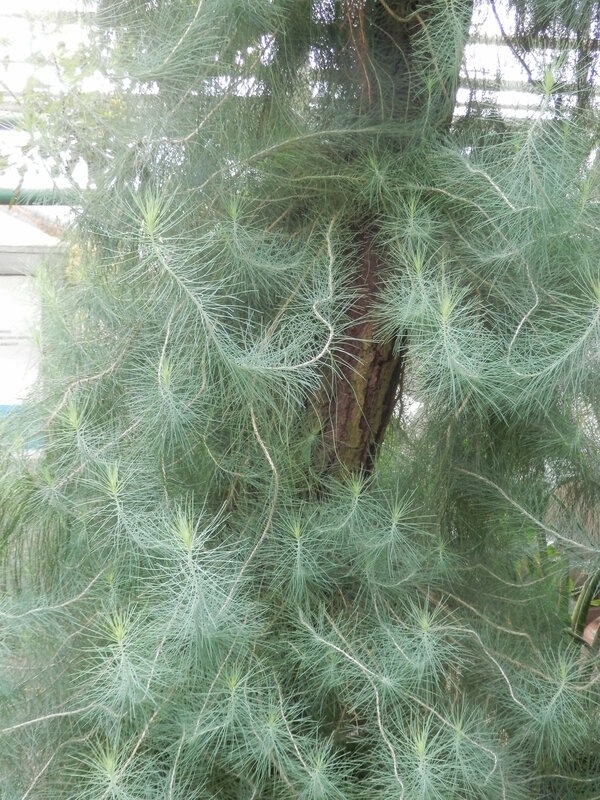 We walked passed the pavilions across the entire park, trough an area with fruit trees, through a forest and along several ponds in order to reach Botanical Gardens. A lot of things have been renovated the last decade, but the Botanical Gardens, a bit out of reach for tourists, is still on the to-do list: the main glass house is currently being rebuild, but the main building and the other, smaller glass houses are a little run down. The aging administrator was nevertheless very happy to see us. She did not speak English but she did speak French, and she clearly enjoyed the change to speak it with me. It was raining softly when we were heading towards the Botanical Gardens but while heading back to VDNKh the raining intensified. We had a burger and a coke, and like the other parks in Moscow, no alcohol is served at any of the food stands. We had to wait a bit for the burger to be ready, but we didn’t mind, we were happy to sit under a shelter sheltered from the rain. The teenager baking the burger was very happy to be able to practice his English. 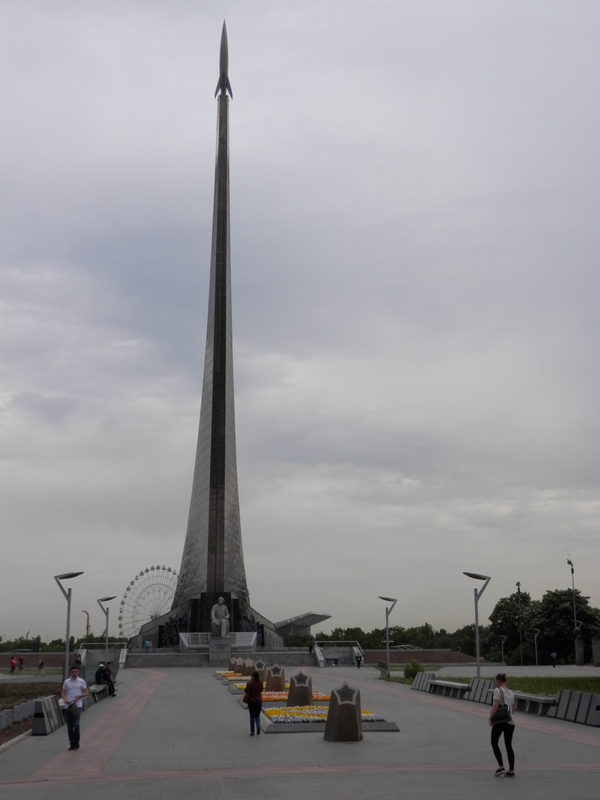 We headed back to the entrance of the park were the Memorial Museum of Cosmonautics is located in the base of the Monument to the Conquerors of Space. 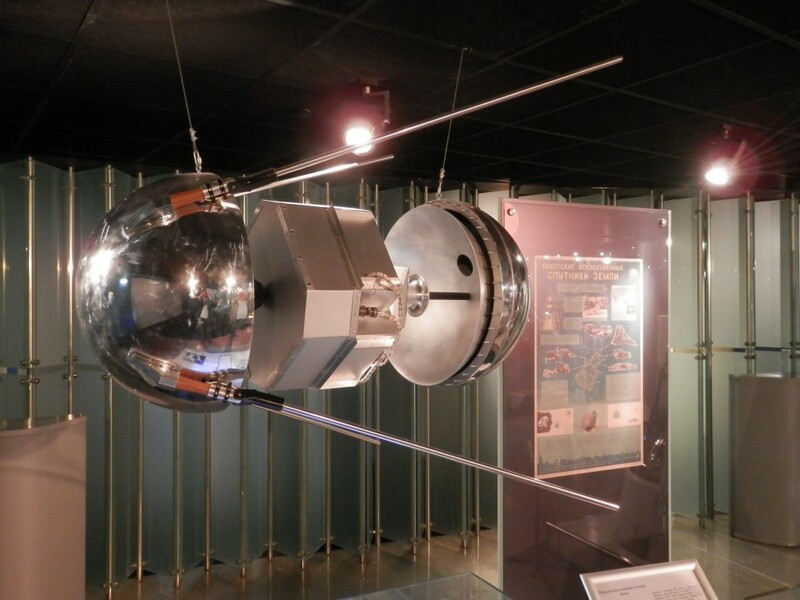 The museum is which was quite interesting, and has replicas of the different Sputniks, space suits and exhibitions about the exploration of space and the space programs. Outside the museum and monument there are several statues of the first space explores such as Yuri Gagarin and Valentina Tereshkova the first woman in space. When we left the museum, the sky had cleared up and it remained dry for the remainder of the day. 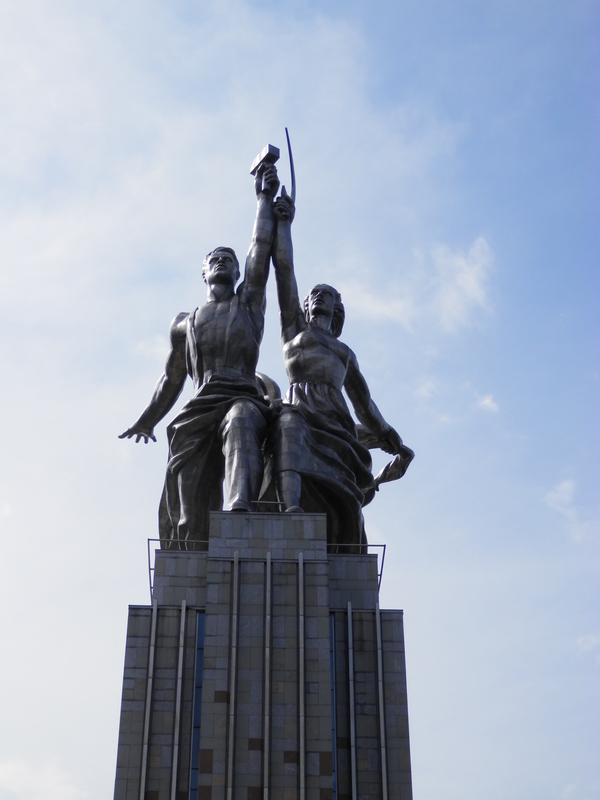 Before heading back to Moscow center, we walked to the Worker and Kolkhoz Woman statue, which is also the logo of the Mosfilm film studio. Since this was our last evening in Moscow, we drank a White Russian at the GUM terrace looking out on the Red Square. The evening was warm, so we walked to Gorky park along the Moskva river. There were celebrations for the troops with firework, but contrary to what we thought, the fireworks were not in Gorky park, but some distance from it, so we didn’t see much of the fireworks. 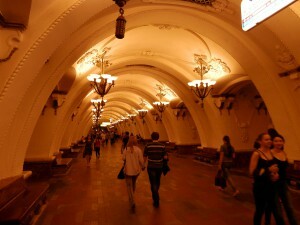 On Friday we said our goodbyes to Moscow and took the metro to the Leningradsky railway terminal. When we came above ground and walked along the different platforms, we were confused. we saw trains heading to Vladivostok and Beijing and other places far in the east, but not to our intended destination: Saint Petersburg. 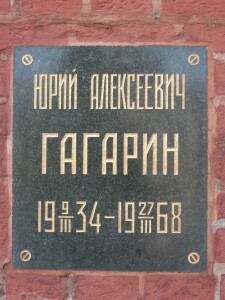 After a while, we realized that we were walking in Yaraslavskaya railway station, which is adjacent to Leningrad station. We were early, so there was need rush or worry. 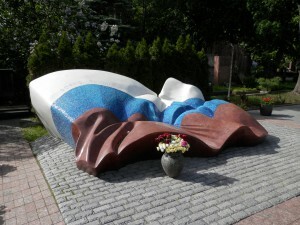 We walked to the other, correct, station and enjoyed there a Baltika 7 beer in the waiting room. 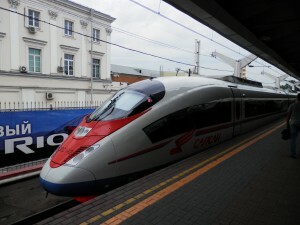 Saint Petersburg is about 600 km to the north west of Moscow and the Sapsan high speed train completes the distance in just under 4 hours.